In order to invoke the Stored procedure, schema was generated from it and Message to be sent was constructed with the help of XML document variable. And this is the place the issue was - incorrect method usage, correct method to be used is LoadXml(). Question might come in mind, why no error while compiling - it is because Load() and LoadXml() are both valid method for loading XML. Although the purpose of both method is same i.e. to load XML but it differs in the way they work. Load() loads from a certain source i.e. either from a stream, TextReader, path/URL, or XmlReader, whereas LoadXml() loads directly from a string i.e. the XML contained within a string. 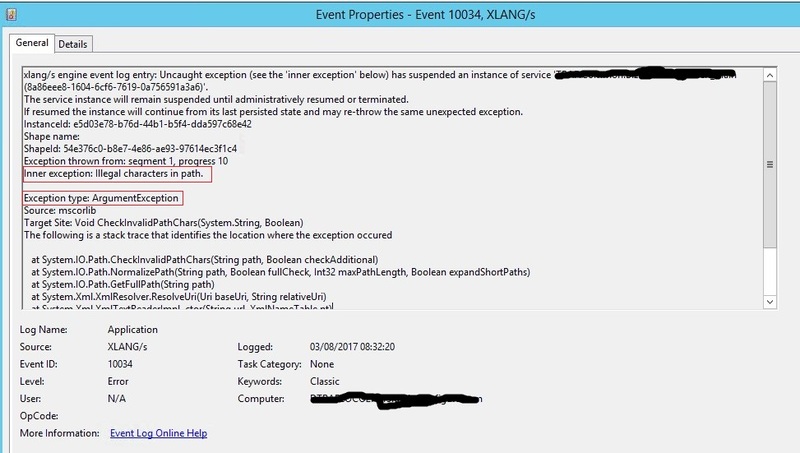 Thus when used Load method, at runtime XLang engine looks for path of the source but as there was no path it threw an exception - illegal characters in path. As here XML was to be read from string, LoadXml() method is the correct one, after doing this correction issue was resolved.